Lubrication is key to keeping your machining center running smoothly and extending its life. At Enshu, we’ve simplified the design of some of the lubrication points, which can be different from other machine tools out there. To help answer some frequently asked questions about these units, we’ve broken down the facts to the five key lubrication points on your Enshu machining center. What lubricant does it use? Where does the lubricant go, and what is its purpose? Enshu machining centers are unique in that they have a single lubrication unit for both the linear axes’ slide ways as well as the spindle’s oil-mist bearings. Along with getting pumped through the piping system to the linear guides, ball screw support bearings, and ball nut, the lubricant is pumped to a special mixing block where it is precisely metered and mixed with dry air. This oil mist is then delivered to each of the spindle bearings through a series of small tubes. This mist provides lubrication and positive pressure in the bearings for a longer life as well as to prevent contamination. The GE460H & GE480H Lubrication Units look very similar to other machine tool lubrication units. 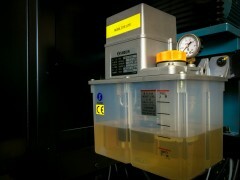 These other units require a different lubricant, ISO G68, which, when added to an Enshu’s lubrication unit, does not produce the fine mist that is required for the spindle bearings of the GE460H and GE480H. If the wrong lubricant is used, it will lead to poor distribution at the spindle bearings, thus reducing the life of the Enshu spindle. Be sure to only add ISO HL32 lubricant to the lubrication unit of the GE460H and GE480H. Chiller units circulate lubrication oil through the spindle jacket, the ball screws, and the servo motor mount castings to cool and prevent thermal displacement for higher machining accuracy. It does not directly contact the internal spindle bearings; instead, the ISO FC5 circulates around the spindle and returns to the tank. We recommend changing this oil annually or after 1,000 hours of operation. 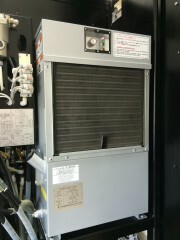 The filter on the heat exchanger of this unit should also be checked and cleaned on a regular basis to maintain cooling efficiency. 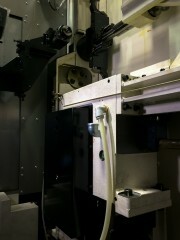 The HL32 goes into the hydraulic unit of the Enshu machining centers that have them. 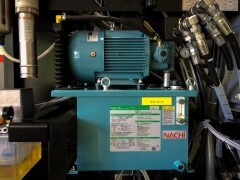 The oil powers the spindle unclamp unit and pallet changer unit on those specific models. The oil should be changed annually, if the color darkens, or after 1,000 hours of operation. The small radiator on the pump unit should also be inspected and cleaned on a regular basis to reduce heat buildup. The lubricant goes into the ATC unit’s reservoir, which lubricates internal parts. The Enshu machines typically have a breather hose plumbed outside the magazine area to prevent contamination from coolant mist. The oil in this gearbox unit should be changed annually or after 1,000 hours of operation. 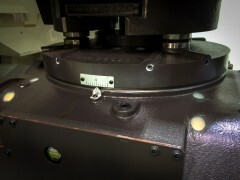 The GE series with B-axis table has a gearbox with oil reservoir. The Enshu B-axis has a special seal between the rotating and non-rotating surfaces to prevent the entrance of machining coolant into the oil reservoir. If any coolant gets past this special seal, it gets trapped in a labyrinth and is drained away. The oil should be changed annually or after 1,000 hours of operation. The oil level and color can be checked easily through the oil sight glass. If you have any additional questions on lubricating or maintaining your Enshu machining center, don’t hesitate to contact us. We’re here to help you keep your machine tool running better for longer.